We have reached a critical turning point, something every nation faces periodically. Modern American society faces choices that will determine its future. Will we rally together to address the overriding malevolence of the causes of climate change before it is too late? Will we fight for our democracy or give in to political autocracy? Will we return to the prior societal norms of open and blatant racism, sexism, and homophobia? Answering these questions is inevitable. If we do nothing, we will have forfeited the right to object and surrendered our autonomy to those who would rule us. Underlying each concern we must address is a set of facts—real, actual facts, not “fake news.” Philosophers of science Cailin O’Connor and James Owen Weatherall in their notable new volume “The Misformation Age” explain how societal groups distinguish truth from fiction. First using examples from scientific and medical communities, the authors employ mathematical models of interaction. No one person decides truth even in a dictatorship. Many people with influence and political power interact to inform the rest of us what “is” and what “is not.” They will prevail unless we remain vigilant. Obviously, labeling opposing and dissenting views as “fake news” has a palpable resonance in the era of Donald Trump. His opinions have power only because they mirror the views of millions of Americans who voted for him. The lies Trump lays out in front of migrants seeking asylum in America are fabrications, but the evident fear of brown and black people among a significant minority of American citizens makes Trump’s prejudice frightening. In Trump’s world his base consists of patriots from the ancien regime who will remake America into what it was many decades ago. As O’Connor and Weatherall explain, false beliefs spread because we are all connected. We share a common experience in the modern age. We also start with family and religious prejudices that narrow our choices among facts. We value proffered evidence based on preexisting norms that meet our need for some measure of certainty. 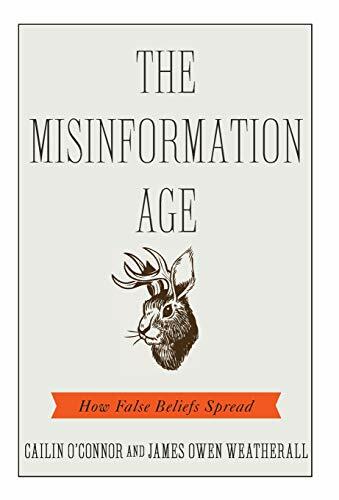 The Misinformation Age explains systematically how facts are determined and changed—whether it is concerning the effects of vaccination on children or the Russian attack on the integrity of our electoral process. We are bombarded daily with advertising and propaganda. Although we have become sophisticated enough not to believe everything we hear or see, we still must make choices based on the available body of information without really knowing what is true and what it not. In fact, we have no choice but to carry on our lives based on this information combined with personal experience and evaluation. Hopefully, this process of re-evaluation will happen as a result of this time of troubles under President Trump. He may rail against the press as the “enemy of the people,” but the media has fought back with countervailing facts. Once again, as was the case with Richard Nixon, the press will ultimately save us. This time, however, Trump has the support of some elements in the media and among online and radio activists who can spread their views unrestrained. Social networks parade their contents as truth, and we do not have the means to control them. We only have the “marketplace of ideas” to sift out the truth, and that may prove insufficient. We are left with the hope that people are good and fair and not despicable. O’Connor and Weatherall’s work will help us face the “alternative facts” that Trump relies upon. Roger Abrams is a staff reviewer at New York Journal of Books.